Well can you believe it, it's Saturday again and you know what that means? yes stitch of the week brought to you by the lovely Mary Corbet. This is a very very pretty stitch and could be a border or indeed you could make a flower from it or a pattern (like a paisley swirl).... which means it is a great stitch to learn and is very versatile. 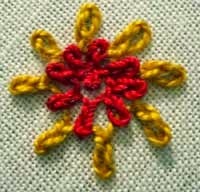 In addition I thought that if you stitch it upwards it would look like a lupin flower? ... I am going to try that!